Every Sunday we give you a behind-the-scenes tour into the heart of creativity, the artist's studio. 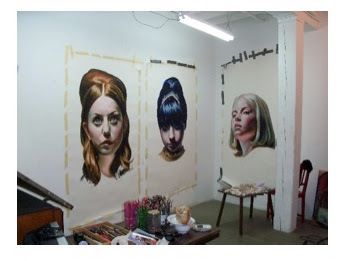 This week we visit the art studio of Mercedes Helnwein. Her images capture a 60's style paired with an ominous anonymity. Rendering with pastel and pencil she often works from stills of videos that she creates. Her work has a very dramatic nature which comes across in the facial expressions and the poses of the figures. The dramatic lighting furthers the effect nicely as serious women with unwavering gazes strike a curious blend of tension and distance.